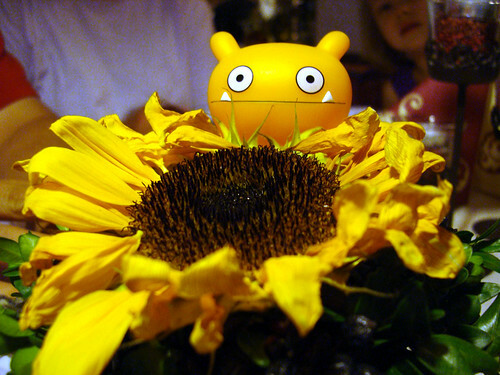 Uglyworld #103 - Wage & The Sunflower, originally uploaded by www.bazpics.com. Last night after trying to acquire cookies in Maburg (and sadly finding out there were none left in any stores) we went up into the old city (alt stadt in German) for dinner to one of our favourite Italian restaurants. Normally we sit outside but it was already starting to rain and the look of the black clouds rolling in made the choice of an "inside" table easier to make. Wage was still sulking about his cookie-less 2 days here until we started to talk about summer holiday which starts off on Wednesday evening when we drive from Aachen to Calais (France), get the ferry from there to Dover (England) and then drive all the way up to Blantyre which is located about 12 miles outside of Glasgow (Scotland) - from there we spend a few days local and then head out onto the Islands of Skye, Harris, Lewis, Uists, Benbecula, Eriskay and Barra. Wage was soon forgetting all about his cookies and instead kept asking questions about Scotland - one such question was "Do they have bigger sunflowers than this in Scotland too?"